Get your team using Jobber faster with instant SMS text invitations. A step towards a more efficient service business is an organized team. That’s why we connect your team to Jobber using both email and SMS text invitations. It’s easy to get your team on the same page. All you need is your team member’s name, email address, and phone number to add them to your Jobber account. 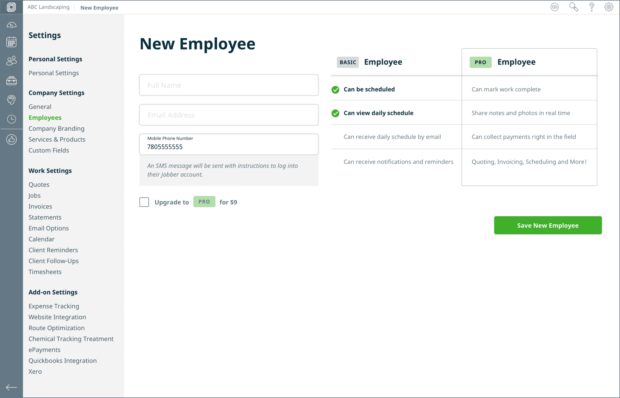 Jobber will automatically send your team member an email and SMS text message letting them know to set up an account by setting a password. Once they set their password, they can start working. That’s all it takes to set up an employee. Your team can now mark work complete, share notes and photos in real-time, collect payments in the field, and more. Check out this help article for more information on adding team members.